There are many factors to consider when selecting an air freshener for your space including, size of the room or space, air flow, level of odor to neutralize or cover, fragrance sensitivities, etc. There are two main types of air fresheners, active and passive; below you will see each of these types of air fresheners broken down to help you select the right option for you. 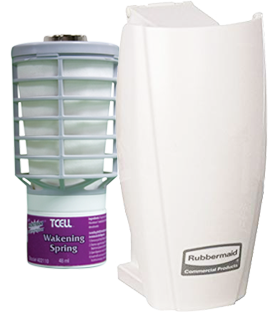 For fragrance sensitivities, we offer fragrance free air freshener refills for our Pump and TCell dispensers which neutralize odor without fragrance. 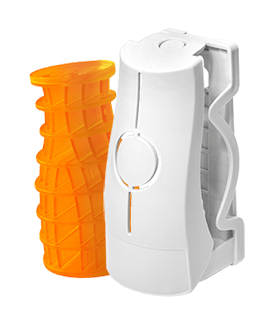 Active air freshener dispensers use mechanical or gas propellant to deliver scent. There are several different types of active air fresheners. Aerosol air fresheners use a propellant and fragrance, packed under pressure in a sealed container. When the valve is opened, fragrance is forced through the spray nozzle creating a mist containing the fragrance. The fragrance mist will stay in the air for about 12 minutes and will circulate with air flow. Works well in areas such as restrooms with poor air flow, but equally well in larger, open areas with good air flow. Aerosol dispensers are not ideal for tiny, single restrooms as mist could fall onto the occupant, if not given the space to disperse. 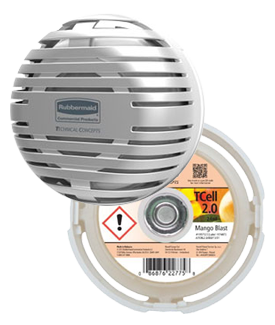 Microburst 9000 – Unlike standard aerosol air fresheners, the Microburst air freshener features much more fine particles which keeps the fragrance in the air longer and provides better coverage with air flow. Micro9000 refills contain 9000 sprays for longer time between refills and better cost efficiency. Microburst 3000 – The Microburst 3000, like the Microburst 9000 features very fine particles for longer lasting fragrance and better coverage. Micro3000 refills contain 3000 sprays, which is the only difference between the 9000 and 3000. AutoMist – This programmable dispenser can be used for standard aerosol refills or for the Micro3000 or 9000, making it the most flexible dispenser we offer. AutoFresh – The Autofresh dispenser is a programmable air freshener dispenser for standard aerosol refills. There is also an Economy version which sprays every 15 minutes. Pump air fresheners do not use a propellant to disperse the fragrance and the liquid is not contained under pressure. Because of this, the mist released tends to have larger droplets, which are heavier and can fall much quicker than an aerosol. Pump air fresheners tend to see less coverage than an aerosol for this reason and would be best used in an area with good air flow, this will help keep the scent suspended longer. Pump dispensers are not ideal for tiny, single restrooms as the droplets may fall onto the occupant, if there is not adequate space to disperse. Passive dispensers do not require batteries, fans or propellants, and use natural air flow to deliver fragrance. 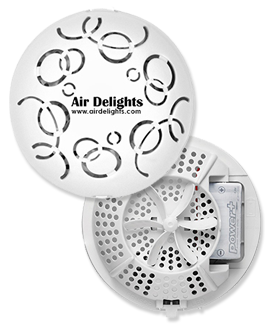 Air Delights offers several variations of passive air fresheners. 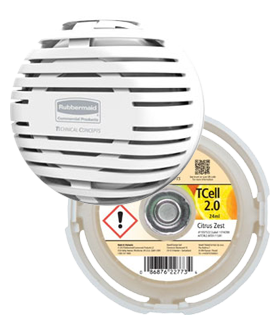 The TCell is a passive air freshener that utilized a unique fluid deliver system to deliver a precise dose of fragrance and odor neutralizer without the use of a propellant. The TCell uses a solution release fuel cell which works by mixing hydrogen with the fragrance solution and then releases tiny molecules of the hydrogen and fragrance mixture. The TCell works continuously releasing fragrance for 60 days. The TCell works best in a room with good air flow as well in small spaces. 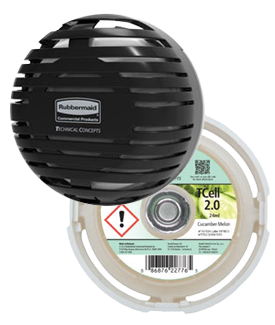 However, if air flow is an issue TCell does have a fan dispenser which can help circulate the air flow to better spread the scent. Solid air fresheners are, as the name implies, a solid material (typically rubber or silicone) which has been infused with fragrance oils, which means there is no messy gels or liquids. The molecules of fragrance dispensed from solid air fresheners tend to be lighter than those of aerosol and spray fresheners, which allows them to stay in the air longer, however solid air fresheners do not have any propellants and rely heavily on air flow and tend to not have the same coverage as active air fresheners. 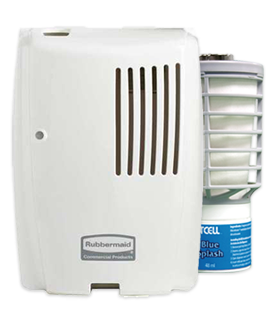 Solid air fresheners work best in small spaces or areas with good air flow. If Air Flow is a problem there are fan dispensers that can be used to help circulate the air for better spread of fragrance. Eco-Air – The Eco-Air is a solid air freshener that delivers consistent freshens for 30 days. 100% recyclable! Air Fresheners provide odor control while enhancing your space with a clean fresh fragrance. 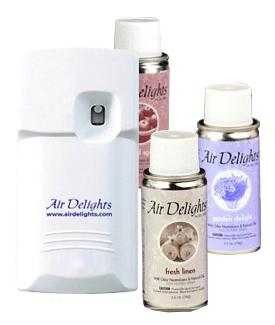 Air Delights is an innovative air freshener and odor control manufacturer since 1991. We strive to create the most pleasing fragrances for our air neutralizers. 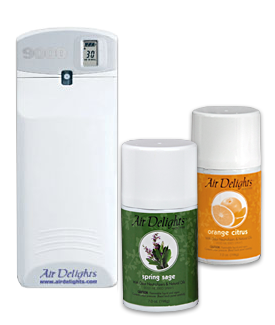 Our metered air fresheners use the highest quality essential oils to create the most pleasing scents that will transform any space with an odor control problem. 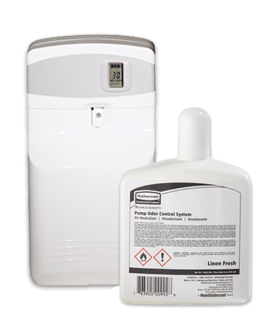 Combined with one of our programmable automatic air freshener dispensers you can dispense metered air neutralizer on a timed basis for even more control. Fall is in full swing. The leaves are changing and the temperatures are dropping. 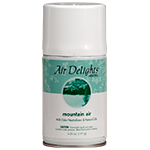 It is the perfect time to bring some of Air Delights’ incredible fall scents into your home or workplace. 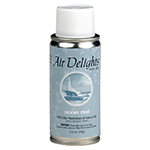 Air Delights’ Delicious Apple fragrance is quickly becoming one of our most popular fruity fragrances. 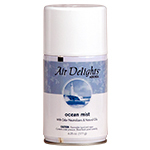 The holidays are welcomed in to your home or office space with Air Delights’ Cinnamon air freshener. Cinnamon is one of the most popular fragrances that Air Delights offers — especially during fall and winter — comprising a blend of cinnamon and spicy notes that are enhanced with curls of clove and allspice. 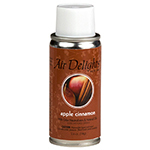 Air Delights’ Apple Cinnamon is a fragrance that will bring the holidays in to your home year-round. The scent is composed of a warm, mouthwatering fragrance of spicy cinnamon and red apples that are intensified by notes of clove and allspice — like apple cider around the holidays. Bring in one of the most popular fragrances among home owners and commercial building occupants alike. This is no less true with Air Delights’ Vanilla Bean air freshener. Vanilla beans blend together with coconut for a warm, inviting fragrance that users know and love. Because the cover is the air freshener, Easy Fresh has the most exposed surface area of any refill resulting in maximum fragrance release. The Easy Fresh fragranced cover is composed of a unique material containing 2-3 times more fragrance than gels or metered aerosols. The motor-driven fan moves fragrance further than a typical passive system, thus freshening larger areas. Easy Fresh is programmed so that as the 30 days pass and the fragrance evaporates, the fan spins more frequently keeping the room smelling just right. The smart chip controlled fan freshens consistently since it turns sparingly in week 1, and gradually turns more frequently until week 4 when it runs constantly. Maintenance is simple with easy to use LED and audible reminders along with a push button cover for quick removal and replacement. Cannot spill or misfire, part of the industry’s first closed-loop recycling program so it’s easily recyclable. 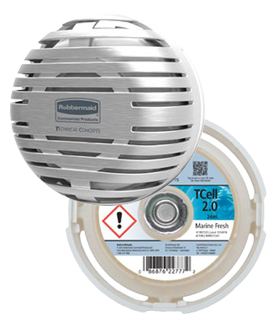 TCell utilizes a patented fluid delivery system, delivering a precise dose of pure designer fragrance, odor neutralizer, and air freshener that remains constant for 60 days. It is the perfect environmental solution because it does not contain propellants or added VOCs and the components are recyclable. Position the dispenser in an area where moving air will disperse the fragrance and neutralizer throughout the entire area, normally three to six feet from the entranceway. One dispenser covers approximately 6,000 cubic feet. The Microburst 9000 Aerosol Dispenser uses state-of-the-art Smart Chip technology to maximize odor control effectiveness, reduced cost-in-use, and provide visual and audio indicators to minimize labor cost. Hi-tech dispenser creates a “We Care” image. Up to 180 days between refill changes. “ME” = Normal situations (sprays every 14 minutes). “HI” = Problem areas (sprays every 7 minutes). Can operate 5, 6, or 7 days per week. You select the number of days to operate. One beep is emitted for low batteries while two beeps indicate an empty refill. Can be deactivated. Monthly battery replacements are a thing of the past. Smart Chip technology extends battery life up to 3 years on 2 D-Cell alkaline batteries…a big cost saving feature! Prevents refill theft without a key. 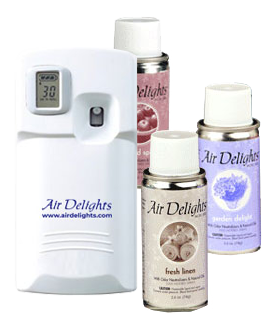 Air Delights Microburst 9000 automatic air fresheners and air neutralizer are the most effective, long-term air freshener dispensing system with revolutionary odor neutralizing and fragrancing technology. 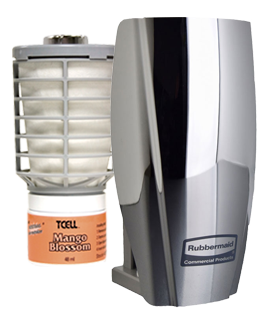 The Microburst 9000 air freshener system delivers maximum odor control for a full 90 days from one Microburst 9000 air freshener refill. 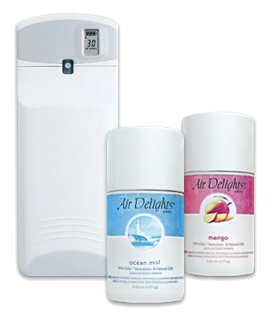 Optional programming extends air freshener refill life to 180 days while providing exceptional odor control. 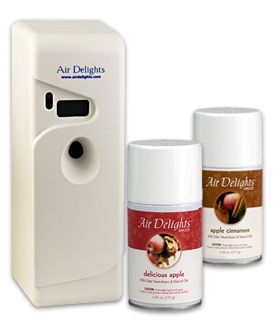 Air freshener and commercial plumbing product distributor, Air Delights, Inc., releases a new scent that is taking over restrooms by storm! After riding in an Uber and smelling a cologne-scented car air freshener, it occurred to owner Steve Bronson that the distinct scent was something his line of air fresheners was needing. Thus, Blue Wave was born. The new scent is the 18th addition to the company’s current line of signature fragrances. The scent was aimed at creating a common scent that was familiar and refreshing. The company’s current customer favorite is the Fresh Linen scent, and they were trying to create a strong runner-up. Looking at what made Fresh Linen so popular, Air Delights conducted a simple survey of just asking their regular customers over the phone. When a case of Fresh Linen air freshener refills was requested, they would casually ask the customer what they liked about the Fresh Linen’s scent. Time and again, the same word was heard — clean. The new scent goes great in men’s restrooms where odors tend to be a bit more intense. “Urine is the foulest scent a business could have associated with it, especially a restaurant”, Bronson adds. “We were looking for something that would smell more native to a restroom.” Blue Wave mimics a clean smelling man, making a men’s room visit much more pleasant. The scent has also been requested in women’s restrooms at nightclubs and upscale restaurants where cologne is a familiar scent that women love as well. To smell what the “new clean” smells like and check out more restroom accessories and commercial plumbing products, contact Air Delights, Inc. online at airdelights.com. 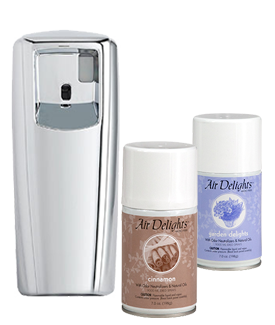 All Air Delights refills are also made to fit your standard AutoFresh Air Freshener Dispenser, Microburst 3000 or Microburst 9000 fragrance dispensers as well. 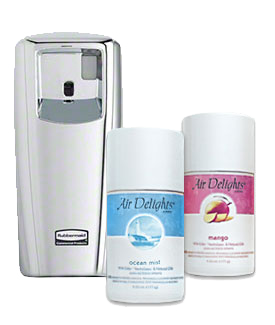 Air Delights is one of the largest distributors of air freshening, commercial restroom products, and plumbing valves in the United States. Our mission is to offer our customers the best selection of the highest quality plumbing fixtures and restroom accessories while providing excellent customer service and fast delivery. We believe that customer service is about taking care of the details, so our customers don’t have to. Consumers can now program essential oil fragrances into their lives with the AutoMist Automatic Air Freshener. 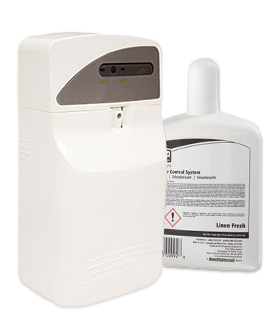 Ideal for use in any facility that needs a little extra odor assistance, this air freshener is ideal for the restroom, office, or any other commercial space because it can be programmed to release fragrances for any window of time. Consumers may set the air freshener to release essential oil fragrances to dispense all the time (i.e. For a location that includes night shifts), or they can adjust it so that it operates just during business hours or just during certain days of the week (i.e. Monday through Friday, from 9 a.m. to 5 p.m.). This kind of flexibility allows consumers to save battery life and allows the air freshener refill to last longer while ensuring that the commercial space, restroom, or office is filled with delightful fragrances whenever desired. The real-time military clock allows for flexibility in programming, while the option to program for 3,000 or 9,000 spray refills adds improved flexibility and convenience to consumers’ air freshener experience. Programmability and convenience are not the only outstanding features of this air freshener, however. The AutoMist uses the essential oil-inspired Air Delights air fresheners. 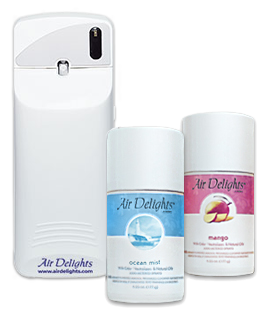 Air Delights use high-quality essential oils to create beautiful fragrances that can relax, invigorate, welcome, and appeal to anyone. With almost 20 different varieties from which to choose, consumers can select the fragrance that best suits their preferences and needs, or try a different fragrance every time they need a refill. Try the Blue Wave or Orange Citrus fragrance in the restroom, or the ever-popular Vanilla Bean in a commercial facility where the fragrance needs to appeal to a wide range of people. If you want to create a relaxing atmosphere in the office, try the “spray-cation” aroma of Ocean Mist, the open air fragrance of Mountain Air, or the fruity scent of Orchard Splash. Other popular options include the fall and winter perfection of Cinnamon Spice, and the musky fragrance of Spring Sage. The AutoMist can freshen any space up to 800 square feet to allow for use in most restroom or office spaces. While it is designed to fit any commercial brand of air freshener, when you combine the AutoMist, with its flexible programmability, with the essential oil fragrances of 3,000 or 9,000 refill Air Delights Air Fresheners, you create a unique and powerful way to create a welcoming space anywhere.